Are you planning a visit to Angola? Whatever your purpose be, don’t forget to explore charming elegance of this country, such as the serpentine roads of the Serra da Leba pass that leads to the mountain tops, the extraordinary landscapes, as well as the reminiscence of the colonial rule. However, the first thing you’ll need is a visa to enter Angola. The Angola visa requirements could feel a bit more stringent than most other countries, most probably due to the popular belief that the foreigners visit the country only to loot its precious diamonds! So, keeping this challenge in mind, here are some of the important Angola visa requirements that should get your visa application approved! You need to fill out an application form for Angola visa and duly sign it after completion. You can obtain the form easily from the Angolan Embassy website of your country or instead get it from your travel agency. Attach your original passport, photocopies of all the previous passports, and 2 passport size photographs along with the application form. Make sure that the photos are taken recently and the passport is valid for 6 months from the date of return to your home country. It is also required that the passport has enough blank pages for the arrival and departure of the trip to be recorded. An invitation letter from the company you intend to visit in Angola along with the arrangements they’ve made for your lodging needs to be submitted for the visa approval. The flight details, particularly your return flight from Angola, is also to be submitted along with other documents. Instead of booking the ticket itself, you can get a flight reservation from your travel agency to avoid the risk of losing all the booking amount in case of any emergency stay back. You can even obtain a flight itinerary from the travel agency, but ensure that all the important dates and flight numbers are mentioned clearly. You need to include a copy of the tax document paid by the Angolan company as a supporting document. To make sure that you’ll not be a burden to the visiting country, the Immigration officer might ask you for a copy of yellow fever vaccination. Also, attach the copies of your employment contract and a no objection letter from your higher officials stating the purpose of your visit to ensure that your trip is strictly regarding business. Apart from the above-mentioned documents, you can also provide proofs of your financial stability, civil status and permanent address, travel visa insurance details and a copy of the income tax certificate or bank statement for the last 6 months, duly signed and stamped by your bank. You can also include certificate proving your police clearance from the local police station. In case you are visiting Angola for employment purpose, you need to ensure that all the required Angola visa requirements are submitted during the interview. If you fail to present all the requirements efficiently, it might affect the job offer, if you’ve already received it. The most important documents to obtain an Angola work visa, the following documents must be provided. You have to download the Angola visa application form from the Embassy website, fill it completely, and then get it printed. Make sure that you have duly signed wherever required. You need to submit a letter requesting for the visa from an Angolan company. This is to emphasize the purpose of your visit to Angola. You need to attach your original passport with 2 passport size photos affixed to it along with the application form. Ensure that your passport has enough blank pages and is valid for a period of 6 months after you return to your country. It is also necessary to attach a letter stating that you’ll follow all the rules and regulations of Angolan law during the stay. Remember to include the certificates proving your educational qualification and civil status when you’re applying for an employment visa. Apart from these documents, you can also submit your work contract giving the motive of your visit a strong support. A medical certificate stating your health condition, a police clearance certificate, a no objection letter from the concerned officials and proofs of your permanent address are also beneficial supporting documents. More documents can be asked depending on the work you’re going to pursue in Angola about which you will be notified personally. For a short-term visa, the basic Angola visa requirements are same as that of the ordinary/entry visa. The only exception is that the invitation letter you provide must be countersigned by the Angolan authorities along with the ministry of foreign affairs of the applicant’s home country. If you plan to continue staying in Angola or consider settling in the country, you need to ensure that the following certificates to guarantee your stay there. You must have a visa application form from Angola, which is filled out completely and then duly signed. Attach the application form to your original passport and affix 2 recently taken passport size photographs to the application. Provide your work contract with an Angolan company. Attach an affidavit stating that you’ll follow all the Angolan rules and regulations, while you’re in Angola. Submit a curriculum vitae, a valid police clearance certificate, and a medical certificate to claim that you are eligible for a residence visa in Angola. Provide the proof of your civil status, certificates proving your financial subsistence, and Angola visa requirements for proving your educational qualification. Photocopy of residence proof from the Angolan municipality is also mandatory. Attach a covering letter addressed to embassy requesting for the residence visa, as this could make the procedures a lot easier. The applicant has to be living in Angola for a minimum of 5 years in order to obtain a residence visa. So, you’ll be asked to present the proof for your stay in Angola for a duration of 5 years. When you have collected all the Angola visa requirements, enclose all the documents in an envelope and submit them during the visa interview. Make sure that you pay the visa fee and make the arrangements for the interview beforehand, since the processing time is generally a week from the date of submission. 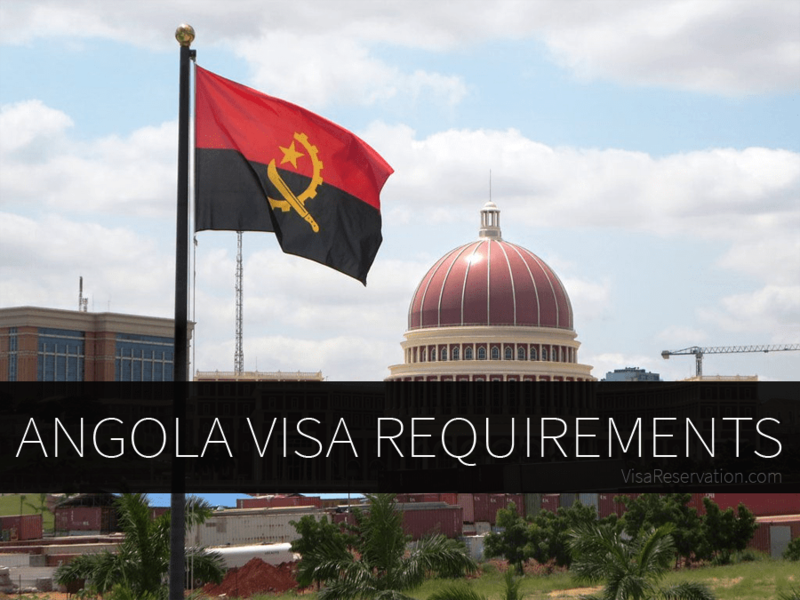 When you apply for the visa at the Embassy of Angola, you’ll also need to provide certain additional Angola visa requirements if requested by the Immigration officer. Once you have all the documents submitted, it should be quite easy to get your visa approved quickly. That said, if you’re finding any difficulty in collecting some of the mandatory proofs, such as the travel insurance for your trip or the flight itinerary for visa, you just need to reach out to us via contact us and book your desired package with Visa Reservation!